Synchronise your Projects Artifacts Link all aspects of your development and test projects by syncing tasks on to common project plans. With a web based interface providing access for the whole team, this is one project plan that everyone can work too, collaborate on and ultimately buy into. Plan and Track your Testing Planning and tracking you test process has never been simple with traditional Word and Excel based approaches. If you're looking to take the next step up with your test management then this is the place to start. If you're looking to save costs with an equivalent feature set to Quality Center then this is the place to end up. Define and trace Release Requirements Implement design reviews, create approval processes and track test coverage of requirements. With list management you can also link requirements to use cases and design documents to cover every aspect of this phase of your development project. 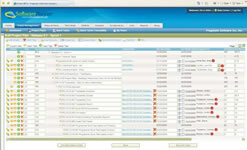 Coordinated Issue Management ALM Complete comes with it's own full featured defect and issue tracking system. Yet we appreciate that these days most companies already have well entrenched defect tracking processes in place. So if you're starting from scratch or looking to integrate with your existing defect tracking system (e.g. Jira) ALM Complete is the place to be. Communication and Collaboration Tools Whilst requirement, test and defect management may be the corner stones of every development project there are many other aspects that are essential too. Collaboration tools that include building up knowledge bases, discussion forums and list management all work together to help you ensure the success of your projects. Ready to find out why ALM Complete delivers the best price/performance combination of any software quality tool on the market? Sign up for a 30 day trial and let us show you how much easier it is to manage your test projects with ALM Complete. Managing your software development lifecycle becomes far simpler with ALM Complete helping you. From managing requirements, tracking project tasks, listing issues/defects to managing test cases, ALM Complete helps with just about every aspect of your development life cycle. Add to that collaborative features like discussion forums, document collaboration and dashboards and you have your perfect solution for taking control of your software projects. The core framework of ALM Complete allows you to define your requirements, create test cases from those requirements and then track defects as you execute your test cases. With ALM Completes clever traceability capabilities you build up a three dimensional matrix of linkage between all these core software development components. Add to that the ability to pull all of those objects on to a project plan at a drop of a hat and you have the next generation in integrated project management. For example when your developer tracks the hours he’s spent working on a specific requirement that information gets automatically feed back up to the project plan to give you a real time project status that not even MS Project can match. Couple this with all the features listed below and you have one of the most advanced applicatoin life cycle tools on the market today. 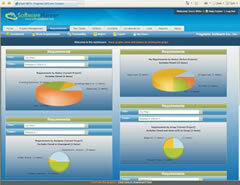 – Web based project management tools that allow all of your team to see, and where required update, the project plan. No more limits imposed by MS Project licenses only available to a select few within your project. – Dashboards to show project burn downs, overdue tasks and resource utalisation. ALM Complete allows you to link requirements to project plans, test cases, defects and more. This means when you look at a requirement you see it’s status within the project plan, how well it’s covered by test cases and which defects are blocking it from being delivered. – Traceability to all the relevant project objects (e.g. project tasks, test cases, defects, etc) gives you unparalleled implementation visibility. – Link requirements to other use cases and store related design documents in the same place. This gives you one central location to store and access all the relevant information you need to implement every requirements successfully. Working directly from the requirements in ALM Complete testers have the ability to develop test cases driven by the requirements they need to test. Link this into the ability to create test cases directly from defects and you can pretty much ensure no re-test is ever missed again. All this boils down to testers being given the essential information they need to carry out their job of writting the best test cases they can. – Organise your test cases by groups, folders and custom fields. This gives you the ability to track your test cases in a way that no spreadsheet based approach will ever compete with. 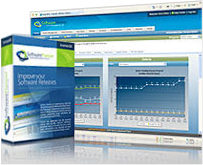 – Integrate your automated (with QTP or TestComplete) and manual test cases to deliver essential whole test coverage reports. This ability to combine both manual and automated test reports allows you to deliver instant reports that would normally takes hours to compile. Whilst just about every software tools vendor provides a defect management too few tools give you the ability to link your defect management process into your test case and requirements management in such a powerful way. This capability not only saves you effort manually manaing this traceability (ALM Complete manages this for your automatically) but gives you the ability to see your project from a perspective that clarifies your project status. – Beyond linking to test cases and requirements you can tie defects to threaded discussions to help aid collaboration and communication on defects being worked on. – Integration with common source code control tools allows developers to track changes made to the code directly from within ALM Complete. Add communication and collaboration in to the mix and you’re provided with an application lifecycle management tool that the whole project team can use. Increaing your levels of effective collaboration helps keep your team working from the same plan and helps imporve communication between interested parties. – Create custom lists to track everything from use cases, tasks, test environments, holidays and much much more. Tie this in with linkage to test cases, defects and requirements and you’ll find it difficult to identify any part of your project that ALM Complete can’t track. – Use escalation rules and reporting triggers to make sure all members of your project team are alerted to important information when ever and where ever they need it. We offer ALM Complete as both a SaaS (we host) and Enterprise (you host) solution. So regardless of your requirements or budget we’re certain that we’ve got a solution that will fit your requirements. Ready to find out why ALM Complete delivers the best price/performance combination of any software quality tool on the market? Sign up for a 30 day trial and let us show you how much easier it is to manage your test projects with QA Complete. Manage the whole software development process from reuqirements, test cases, defects to project planning. Unite the whole process with one softawre development management tool. "The centralization of test cases and test results are easily accessible by many people, including management and team members. QA Complete has improved the quality of our product and thereby has improved customer satisfaction." Manage the full test life cycle.